The day before yesterday I noticed a small lump under my Berlin's front leg. I was shocked and frantic at the same time. It is very small right now but I want to nip it before it gets worse. I am having a raffle to benefit his surgery or for whatever medical expenses it may be. The tickets are $1.00 each. The drawing will be March 1st as I need to get him in ASAP. I have to call for an appointment today 2/13/06 and hopefully my vet won't be too booked up as he is the only one that sees rats around here out of 15 or so vet offices! It is crazy! A rat's view on Valentine's Day! Click here and nominate that special PET and or RATTIE in your life! READ and WATCH about SNIFFY the rat...how he was going to be squashed in the name of ART! Come CHAT on Wednesday nights after 9pm Eastern time and again on Saturdays at 10pm Eastern time. Hope to see you there! 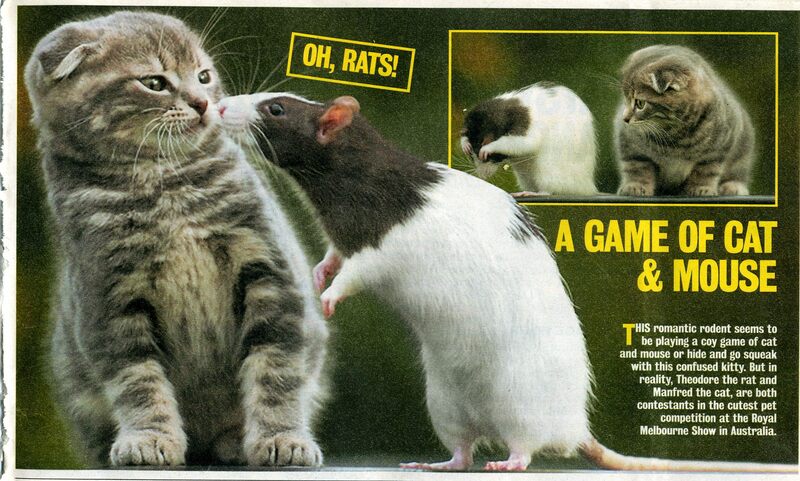 This romantic rodent seems to be playing a coy game of cat and mouse or hide and go squeak with this confused kitty. But in reality, Theodore the rat and Manfred the cat, are both contestants in the cutest pet competition at the Royal Melbourne Show in Australia. I thought it was cute and wanted everyone to see. Thanks mom! THE RAT PACT, Sometimes all love requires is an open mind, and a willingness to risk being bitten. by Rachel Toor from "The Pig and I"
stirred. But I knew I could turn to my friend, a scientist who worked with lab animals. She listened to me grieve for Prudence, and began to tell me about the rats she worked with. "They are so cute, so sweet" she said. "And so smart and interested". And then she asked if i had ever considered a rat as a pet. I had not. I didn't want to replace Prudence; the idea of supersizing my mouse held no appeal. But after I hung up, I thought about it. Newly parted from my boyfriend, I was lonley. I called my friend back. "Okay" I said. "Would you bring me a rat please?" A few days later, I took the train to Long Island, got dinner and a rat, and toted my new pet back to the city in a shoebox. I decied to name her Hester, after Hawthorne's stigmatized heroine. If you're a rat, I reasoned, you don't need to wear a scarlet letter, you are a scarlet letter. The cage was all clean and ready. I reached into the shoebox to remove Hester. Thats when she whipped her head around and sank her ratty teeth into my hand. I yelped and cursed. She may have looked like a bigger version of Prudence, white, with red eyes, and a tail longer than her body, but this rat was no mouse. Telling myself that maybe Hester was freaked out from the move, leaving the comforting flourescent light of the lab and the scent of other experiment-bound rodents-- I tried again to connect with her one Saturday afternoon. I made a peace offering of a cracker. She ignored the food but wasted no time in chomping on my skin. Then she withdrew. She ran to the corner of the cage cowered. I retreated to a corner of mine and sat at my desk, head in hands. I'd always been able to connect with animals. What was wrong with Hester? Or, more disturbingly, what was wrong with me? It was a relief to go to my editorial assistant job. But inevitably I had to come home to a rat infested apartment. Hester would be alert the moment I walked in. Each time I opened the door to give her food, she'd scamper over, a sinister look in her eye, wanting blood, I could tell. I learned to be very quick. A few weeks later after I got her, I could no longer put off cleaning her cage. I opened the door and, after some tentative air sniffing and poking about, she climbed out. I was able to guide her to to the floor, where she could safely hang around while I was cage cleaning. In such a small space, it wasn't likely she could get lost. But once the cage was newly fresh, I looked around and didn't see her. At last I found her, in the corner where I'd piled my shoes, perched atop a pair of Italian leather oxfords. She had chewed a hole right through the top left shoe. I screamed. She looked up at me. Smug? Was that a smug look on her ratty mug? I picked her up by the tail and put her into the cage. Not long afterward I was reading in bed one night and looked up to see Hester in her cage, standing at the door. With a sigh, I decided I'd try once more. Carefuly, I let her outand then placed her up onto the loft bed. While I read, she explored the hills and dales made by the comforter, staying mostly near my feet. I could see her occasionally looking in my direction, watching my hands each time they turned the page. The way she sat, ears alert, whiskers twitching, she almost looked cute, in a ratty kind of way. Suddenly she came charging, right toward my hand lying idle on my stomach. I flashed back to tiny pointy teeth, and just as she got to my hand, I used it to shoo her away. She retreated to the foot of the bed. "Get away you rat" I said. She shook herself off, looked at me dead in the eye and came galoping back. Again I shooed her to the foot of the bed. Again she charged, once more into the breach. I looked at her, she didn't look angry or frightened. She was alert and interested. Could it be? Maybe, just maybe after the initial period of being freaked out, what I had taken for aggression was actually play? Maybe what I had thought was hostility was in fact interest. Had I misread her? Slowly I moved my hand in front of her. She watched, and then gave chase. I stopped and held my hand still. I braced myself as her mouth came near my finger. I froze, waiting for pain. She sniffed, sniffed, and, gently with her nose, nuged it. I moved my hand in circles, and in circles she followed. Hester wanted to play. I put my hand down, palm up. She slowly crawled onto it. I brought her up to my face, eye to eye, and finally we saw each other. I was shocked by my own ignorance, by my inability to recognize her for who and what she was--playful, curious, and engaged. My heart swelled. This, I felt, was the beginning of a beautiful relationship. Every night from then on, as soon as I'd get home, I'd let Hester out of her cage, only putting her back when it was time for sleep. And so we reached an understanding. Until I appreciated Hester for who she was, we couldn't connect. She wasn't who I wanted her to be--Prudence; she was and could only be herself. Love can be an imaginative act not only of seeing what's there, but accepting what isn't. Looking down at my rat, nestled in my armpit, I felt mostly lucky in love. Thank you Randi from the Ratlist! his 3 dogs. This was submitted by a member of Ratlist. surprised to find a message in a bottle taped to the dog's collar. bottle from the dog's neck. of lined paper. Also inside the blue bottle was eye medication. in Tylertown, Mississippi. "He took the time to write us." flowed as everyone learned Himie's story. pots and pans and gathered all the food he could find. too, until Gary is located, in case they're his. Center searched the database for Gary Karcher. far, he's not been admitted to a veteran's hospital. information about Gary Karcher is encouraged to contact Best Friends. well train, and loves kids and other dogs, and house train. winnerdog and they have been on heartworm med also. I stayed with them high & dry for a week on a 2nd floor. I hope they stay with each other. P.S. Here his eye med three time a day to clear up. Rottweiler's dad has been found! call us back once he gets a phone number. can make a positive identification ­- either by photo or in person. We are currently trying to figure out a way to make that happen. scared they'd shoot Himie and he's so thankful he's safe. won¹t teach him to be mean." in his eyes." Gary has had Himie "since he was just a wee puppy." tears, it doesn't get any better. symbol for all of us, who have ever been adopted and loved by a pet. out there. It is truly a powerful devotion to his best friend! with the power to change things! had been found. I sent a copy to my state and federal legislators. speak, for all animal lovers. representatives, and who knows, they might just "get it". home, but really he gives us much, much more! people realize how lucky we all are, to be adopted and loved by a pet! Sign this petition and stop Cruelty 101!